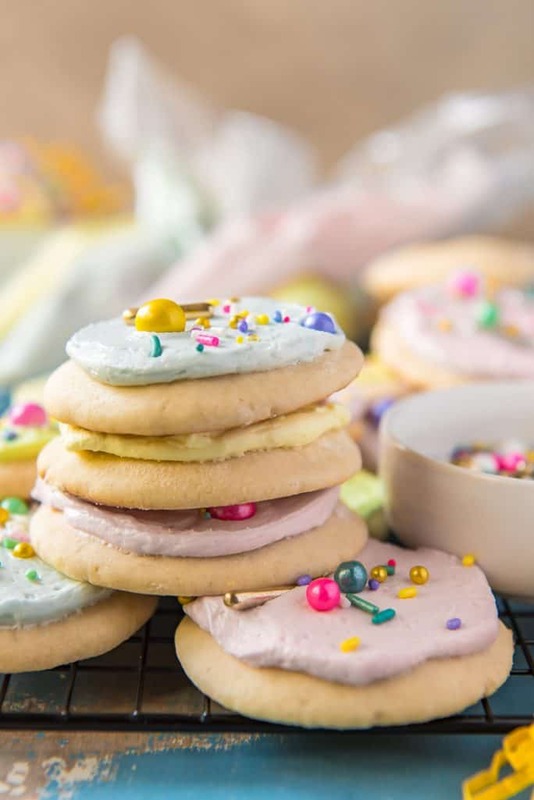 When you can’t decide between cake and cookies, these copycat Lofthouse Soft Sugar Cookies with Frosting are the answer! Thick, chewy, and irresistible, these sprinkled sweeties are a must-make for every holiday! Now that everyone’s shaken off those pesky January diets, let’s get back to some regularly scheduled sweets, shall we? For the record, I’m pretty fond of those cookies. At least I was until I made my own at home. There’s a lot of truth in the idea that homemade baked goods are better. This is one of those recipes that you MUST test yourself, and taste to believe! 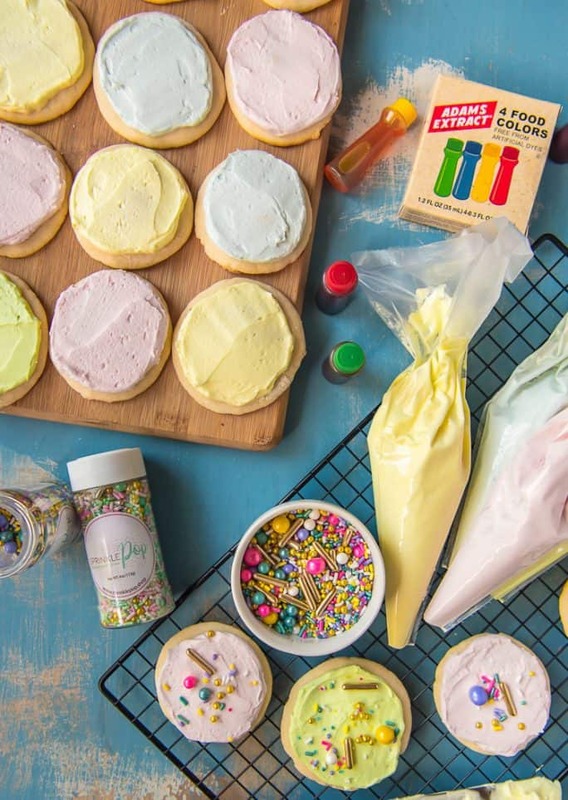 JUST TAKE ME TO THE LOFTHOUSE-STYLE SOFT SUGAR COOKIES WITH FROSTING ALREADY! 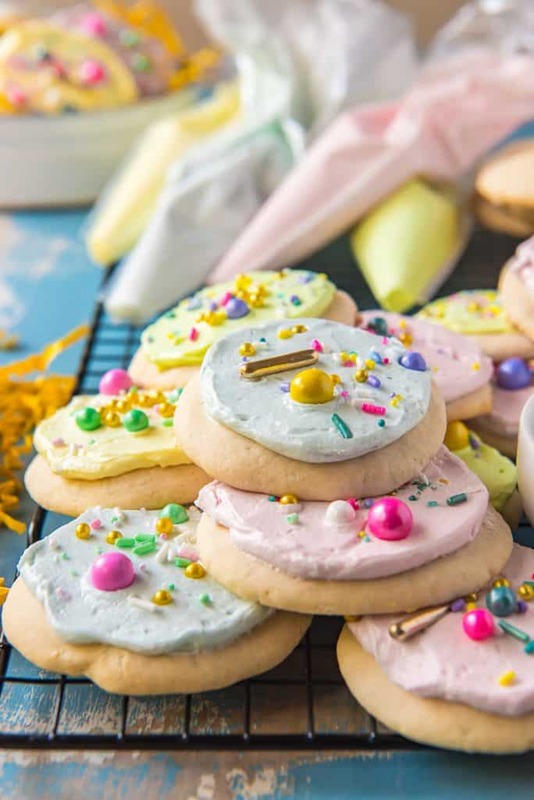 If you’d rather skip my (pretty darn helpful) tips and tricks, essential cooking info, and similar recipe ideas – and get straight to this deliciously easy soft sugar cookie recipe, just scroll right on down to the bottom of the page where you can find the printable recipe card! So, these cookies by themselves are fairly underwhelming, just like most sugar cookies. They’re pasty white, very flour-forward, and ultimately just really boring. Abe will tell you – he ate a couple out of the oven and didn’t hesitate to complain. Such a great recipe critic I married, I tell ya. Turning these losers into the best soft sugar cookie recipe means adding a sweet and creamy sugar cookie frosting! But we can’t just roll with white frosting – we need color in our lives, right?! I recommend gel food coloring for just about any baking project for its fantastic vibrant colors. 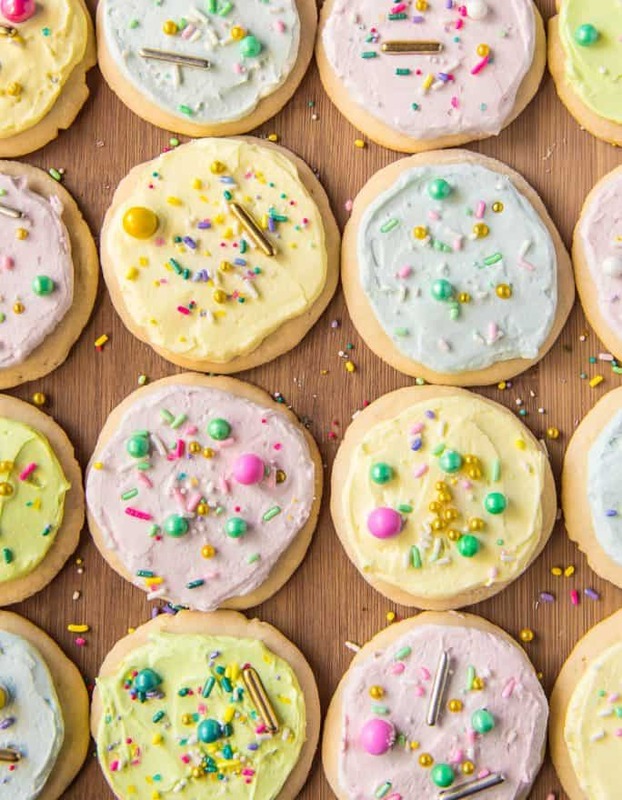 I’m in LOVE with the food coloring from Adams Extract – the all natural kind lent the perfect pastel shades to these pretty cookies! Baking powder AND baking soda. Putting the two leaveners together makes these cookies soft and chewy, with a cake-like texture. Sour cream. In addition to butter, sour cream is added to the batter for extra moisture and tenderness. It helps activate the baking soda to help them rise nicely, making for thick cookies. Sweet frosting. A basic, fluffy buttercream is piped or spread on top of each cookie, giving it a little extra sweetness. This balances out the otherwise bland sugar cookie beneath it. The easy-to-make frosting used on these soft sugar cookies really reminds me of the type I use on my Nana’s Anise Pierniki at Christmas. It’s sweet and vanilla-flavored, nice and fluffy, but sets just enough so that the cookies don’t smudge when you stack them. First, use a mixer to beat softened butter, vanilla extract, and salt in a medium-sized mixing bowl until creamy. Add powdered sugar, 1 cup at a time, and beat on low until smooth. Next, add heavy cream in a slow drizzle on low speed until incorporated. Turn the speed up to medium-high speed and beat for 1-2 minutes until thick and fluffy. To color the frosting, divide it evenly between clean bowls (how any bowls needed depends on how many colors you make). Add a few drops of food coloring to each bowl and mix with a rubber spatula until it’s evenly combined. Feel free to add more drops of coloring to reach your desired color if it’s too pale. Then, once all the cookies have cooled completely, pipe about 1 ½ tablespoons of colored frosting on each cookie. You can also use a spatula to spread it evenly around the cookie. Decorate with sprinkles immediately after frosting each one, as it tends to start crusting over quickly. This makes it difficult for the sprinks to adhere to the cookies. Place completed cookies on a cooling rack for a few hours to allow the frosting to set. Store cookies at room temperature in an airtight container, separated by layers of parchment paper, for 3-4 days. 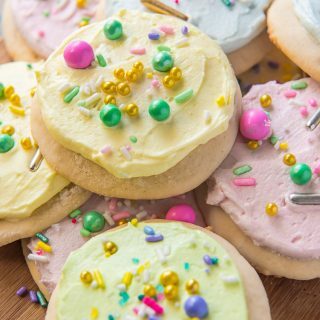 Yes, you can freeze these sugar cookies! This recipe makes about four dozen cookies. If you’re baking in advance of a holiday, or only want to eat a few, they hold up very well in the freezer. After baking and cooling the cookies, place them in single layers on baking sheets, then freeze uncovered until they’re solid. Then, simply freeze the unfrosted cookies in a plastic zipper bag or freezer-safe container. If you’ve frosted all of the cookies and have found your self-control a little lacking, don’t fret! Freeze ’em solid, layer parchment or wax paper between them, then slide them in a plastic zipper bag or freezer-safe container. Freeze them for up to 3 months. Chill the dough. This is a rather wet & sticky cookie dough, and chilling helps it stay manageable when forming each cookie. Refrigerate the covered dough for a few hours after mixing and before baking – even up to overnight. Keeping the dough chilled while you work on rolling one baking sheet’s worth of dough balls is a great way to steer away stickiness. Dust your hands. Keep a container of flour nearby when rolling your cookie dough. Even after chilling, this dough softens quickly between the heat of your palms. Dust your hands with flour between each dough ball to help smooth out the dough, making for a more perfectly pressed cookie. Press them flat. 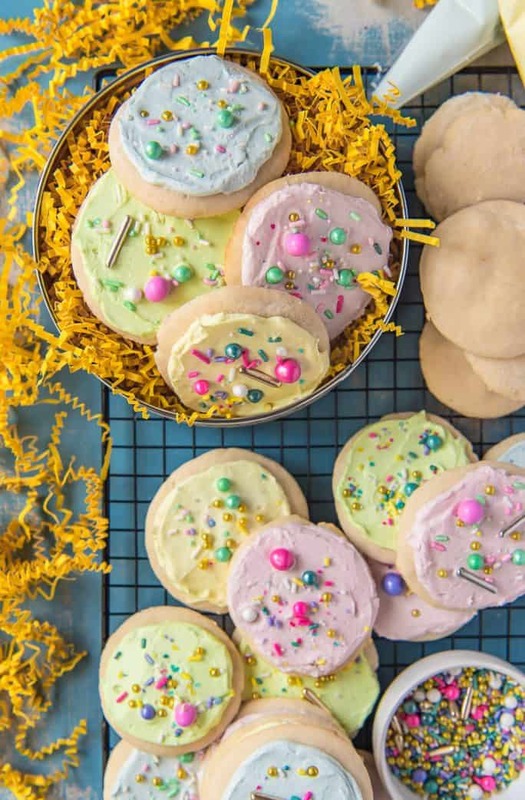 These soft sugar cookies do rise, but baking them as balls will leave you heartbroken, since they don’t spread in the oven. 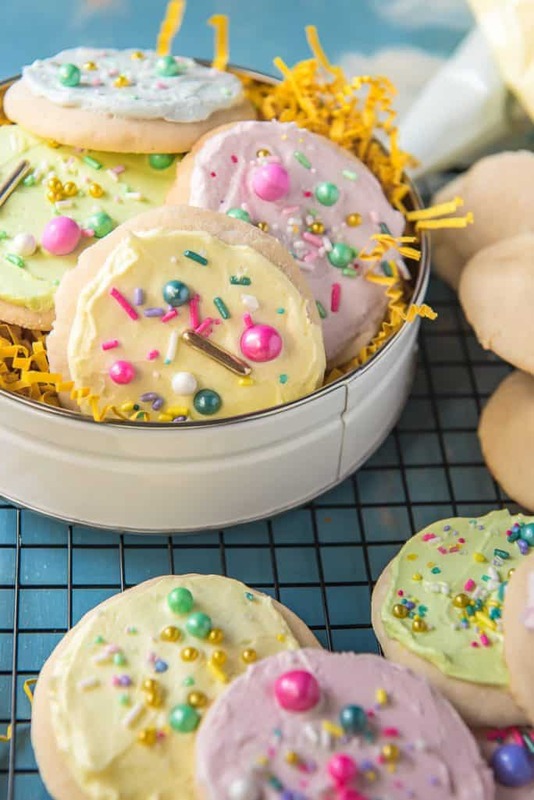 Employ that flour stash and a wide-bottom drinking glass to press the cookies down evenly to about 1/4-inch thickness for optimal icing and the biggest cookie yield. Don’t over-bake them. This is crucial to keeping these cookies soft! They bake at a very high temperature (425 degrees F), and heat rises – so it’s easy to burn the bottoms while the tops still look white. Set your rack to the middle of the oven, and only bake 1 tray of cookies at a time. 5-7 minutes MAX (depending on your oven) should do the trick; keeping an eye on them until you get into the groove is a good idea. The cookie bottoms should be lightly golden, and the tops will remain white. Cool them down. Transfer the cookies to a cooling rack immediately after removing them from the oven to stop the baking process. 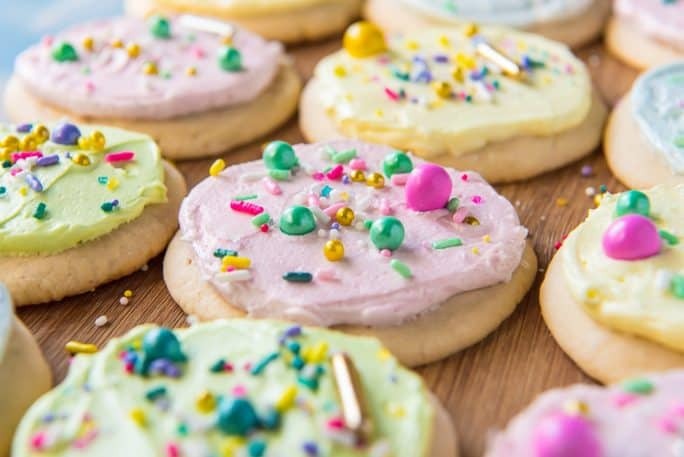 Make sure the cookies are completely cooled before frosting them – otherwise, you’ll have a sticky, runny rainbow-colored mess to clean up! 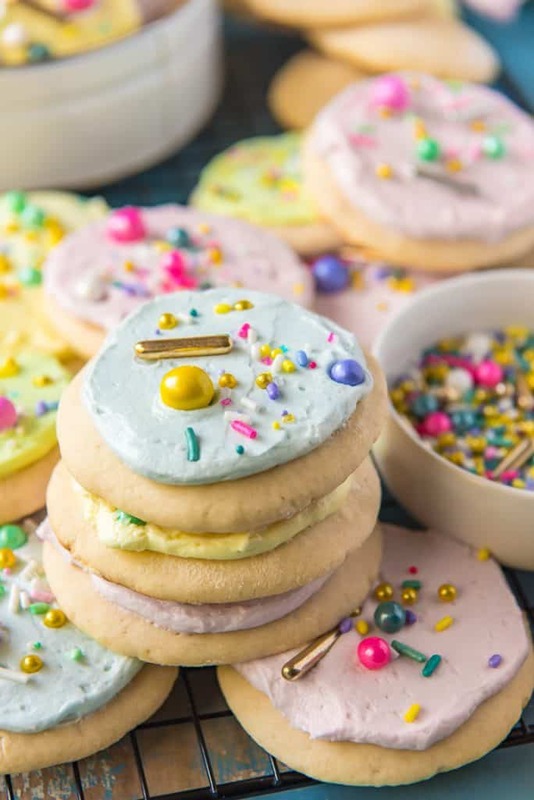 When you can't decide between cake and cookies, these copycat Lofthouse Soft Sugar Cookies with Frosting are the answer! Thick, chewy, and irresistible, these sprinkled sweeties are a must-make for every holiday! Combine flour, baking powder, baking soda, and salt in a large mixing bowl, whisking well to combine. In a separate bowl, use an electric mixer (or stand mixer) to cream the butter and sugar 3-4 minutes on medium speed, until fluffy and lightened in color. Beat in the eggs one at a time, scraping down the bowl after each addition. Add the vanilla and sour cream and beat on low speed until combined. Add half the dry ingredients on low speed, then scrape down the bowl. Repeat with remaining dry ingredients, mixing until just combined into a soft fluffy dough. Cover the bowl with plastic wrap and chill in the refrigerator 2-3 hours, or overnight. When ready to bake, preheat oven to 425 degrees F. Line 2 large baking sheets with parchment paper or silicone mats. Working in small batches, use a medium cookie scoop to portion out 1 ½ to 2 tablespoons of dough. Dust your hands with flour when working with each cookie to help avoid sticking. Gently roll the dough ball between your palms to form a ball. Place on a prepared baking sheet and repeat with remaining dough, spacing the dough balls 3-4 inches apart. You should have between 6-8 cookies on each baking sheet. Dip the bottom of a drinking glass in flour and use it to press the cookies flat to about 1/4-inch thickness. Place 1 baking sheet on center rack and bake 6-7 minutes until very pale golden, with the bottoms barely beginning to brown. Immediately transfer cookies to a wire rack to cool. Repeat steps 8-10 remaining dough, returning the bowl to the refrigerator as needed to keep it from getting too sticky. In a clean bowl, use an electric mixer (or stand mixer) to cream butter and vanilla until creamy. Add powdered sugar, 1 cup at a time, and salt. Beat on low until smooth. Add heavy cream in a slow drizzle on low speed, then beat at medium-high speed for 1-2 minutes until thick and fluffy. To color the frosting, divide evenly between clean bowls and add a few drops of food coloring and mix with a rubber spatula until evenly combined. Add more drops of coloring to reach your desired color. Once the cookies have cooled, pipe about 1 ½ tablespoons frosting on each cookie, then use a spatula to spread it evenly around the cookie. Decorate with sprinkles as desired. Place completed cookies on a cooling rack for a few hours to set. Store cookies at room temperature in an airtight container, separated by layers of parchment paper, for 3-4 days. 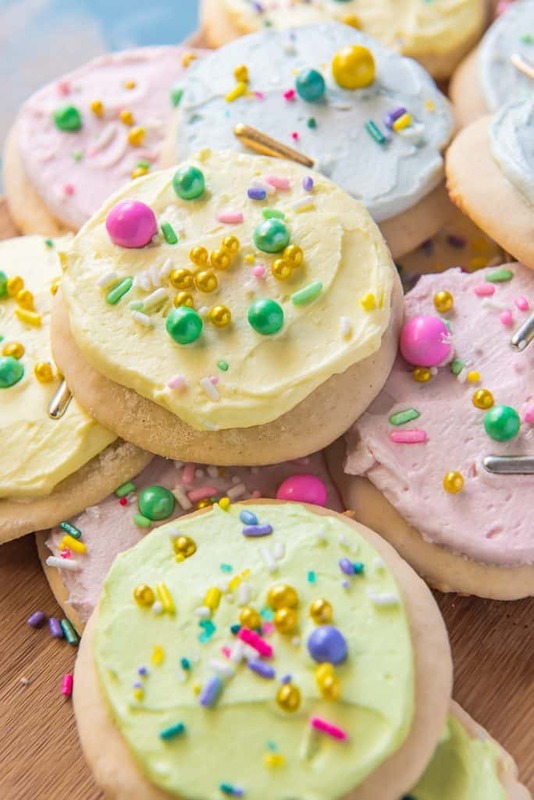 PIN THIS SOFT LOFTHOUSE COOKIE RECIPE FOR LATER!